A Union of Connectedness Between Your 'Real Self' & the Universe! This program is not tied to any specific religious belief or principle, although it draws inspiration from the Hindu, Buddhist & Christian teachings of what the higher self is, and what it means to the individual. Essentially Giovanni created this hypnosis program to help guide you into a state of mindful awareness and tap into the power of the collective consciousness. Doing this you can open up many new doors of possibility like enhancing intuition, changing destiny, more clarity, vision, exposure and awareness of everything in the universe. It has benefits that expand beyond the conscious realm for individuals wishing to explore 'a little deeper' into what makes you unique as a person. 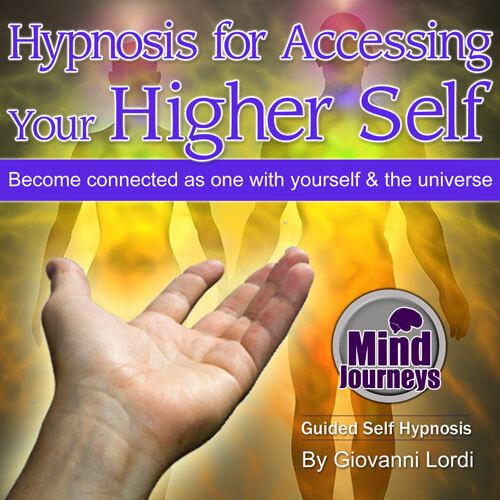 This is a guided hypnosis session where Giovanni will instruct you how to channel your higher self under the hypnotic trance. Accompanied by binaural beats & relaxing music for additional benefit, this is indeed a powerful program. There are multiple gaps of non-spoken sections throughout the recording to give you the personal space to direct your experience in a way that is unique to you. At the end of the recording there is an extended break so that you can have some time to 'find yourself' or to apply the techniques in your own personal way. In a spiritual sense your higher self is your 'true self' once you strip away all the layers and discover your true essence. Religiously it can be used to find connection with the divine, and in a new age sense it as about self-discovery and expanding your consciousness. Some amazing things are reported to have happened by people who have meditated or channeled into levels of their higher self, and this is where some miracles have said to happen. Whatever the case, by seeking to discover your higher self you will be moving into new levels of expanding consciousness, not only as an individual, but as a person connected to the universe and the other people within it. "True inner greatness, I am free, I can, I will, true self, higher self, pure energy, connected as one, one with myself, one with the universe, superconsciousness, I flow."